This is a tale of the land of Terrezial, a vast desert wasteland, filled with all manner of terrifying beasts. Long ago a terrible battle was fought, and with it came the destruction of the lush and vibrant land that once existed. There are few who remember that peaceful land, but those who do whisper the words of a hope, a dream, a legend. Adam and Avery, two young brothers, who live with their adoptive Aunt Mace, could not be more unaware of that forgotten past. They know only the life they have been shown, a peaceful, and quiet existence in a small village. It is not until shortly after their 12th arrival day that they are presented with a startling decision: They must leave everything they have ever known, and venture directly into danger, or bring about the destruction of everyone and everything they love. This is a tale of two boys, a princess, and a journey – A journey that awakens an ancient evil, a forgotten hope, and a world that has been waiting. This is a FUN read! 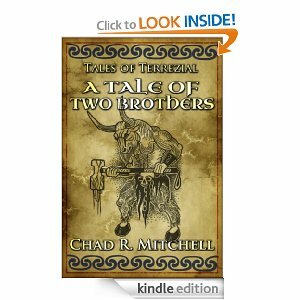 I loved all the adventure and the true fantasy world that Chad creates in this story. Adam and Avery are brothers that I wished I had. They are fun, adventurous, handsome and brave! What I liked most about this book that even though it was a long story, it flowed logically and was a fast read. There was never a dull part and Chad keeps you entertained the whole way. This is book one in what should be a 9 part series. I look forward to reading more of Adam and Avery's adventures. This definitely reaches audiences of all ages!